The Radio-Frequency Quadrupole Linear Accelerator (RFQ LINAC) is operating at LHEP since 2010. This LINAC was formerly used at L3 detector at CERN for calibration of BGO calorimeter. In 2010 it was transfered to LHEP, refurbished and put in operation. It produces pulsed H- ion beam with 2 MeV energy and pulse current of up to 15 mA with repetition rate of up to 50 Hz and pulse duration of 15 microseconds. The accelerator is used to produce intense beam of 9.17 MeV photons, originating from 13C+p->14N* PIGE reaction. The 9.17 MeV photon beam is utilized for feasibility study of the novel method of detection of explosive materials in large Cargo containers, called Gamma-Resonant Nuclear Absorbtion Radiography (GRNA-R). 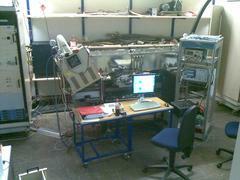 2 MeV proton RFQ LINAC setup at Grosslabor. The accelerator is equipped with Permanent-Magnet Quadrupole beam transmittion line and beam extraction window, which produces 1.7 MeV proton beam in air. 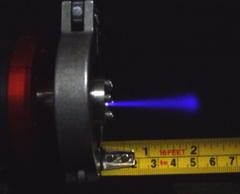 This beam can be used for elemental analysis of various materials based on the Proton-Induced Gamma Emission (PIGE) process. The accelerator also has great unique educational value, allowing our students to learn and touch basics of accelerator physics. 2 MeV proton beam extracted to air. Beam current is 15 mA, repetition rate 30 Hz, pulse duraction 30 microseconds.